With out a doubt, one of the most stressful moments of my life was making the cake for my son and niece's Baptism a few weeks ago. It was all stress that I put on myself, of course, but stress nonetheless! I have a list of things I want to accomplish while I'm 30, and one of which is making a tiered cake. Because of this goal I told my mother-in-law that I was going to make the cake. I have to say, I'm very pleased with how it turned out! Stressful as it was, I am very proud of the outcome! I did decide to make it a little easier on myself by making each tier the same flavor of cake, but two different fillings. I also chose a simple and classic frosting, that is a tried and true recipe in my repertoire! For the Cake I used Dorie Greenspan's Perfect Party Cake, with a few modifications, which I will post at some point. The frosting is my Vanilla Bean Buttercream. On the bottom tier I made a Cookies & Cream filling (recipe also coming later), and the top tier was filled with quite possibly my all-time favorite White Chocolate Cheesecake Mousse Filling. 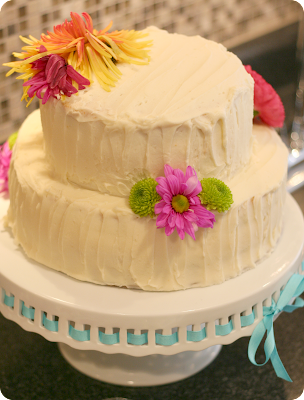 I still have some work do to on decorating cakes beautifully, but now that I've made a tiered cake it's not so scary! Not that I'll make one for every cake occasion, but if I chose to again it shouldn't give me nightmares again. Well, hopefully not, at least! Great job - the cake is beautiful! I think it looks great! You did a wonderful job and I love the flowers on it.